Over the past couple months, we have made regular reference to Chall's six stages of reading development, which accounts for reading development from birth to adulthood. 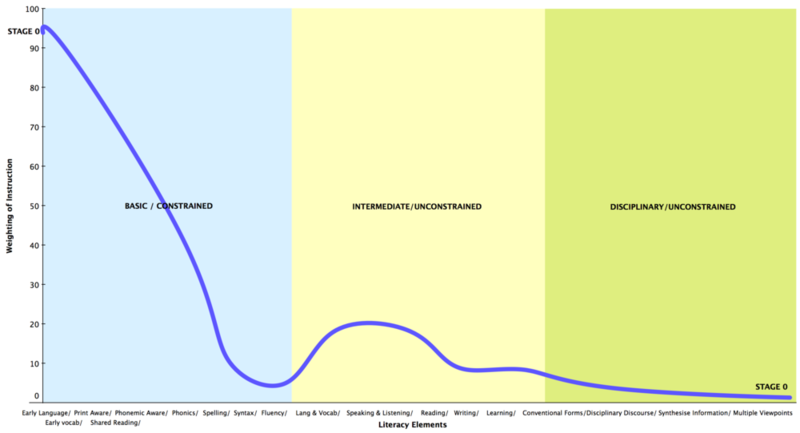 For that reason, we have added a specific section on the stages of literacy development to the Teaching Folder of the site. Therefore, it provides us with a platform to explore the way in which pedagogy changes as learners develop throughout the developmental sequence. If we borrow Wittgenstein’s concepts here, a developmental account of a language/literacy learning progression is sensitive to the way perception (aspect seeing) changes, practices form, attitudes develop, knowledge takes shape and (literate) forms of life take root (or fail to do so). We need to marvel at how learning transpires and how each new act of learning builds from that which came before. We need to be amazed at the small steps and giant leaps that occur. We need to be cautious of stagnation and entropy. In time, we will address the following sequence of questions for each of the six levels. 1. What does instruction look like at this stage? 2. What should learners be able to accomplish/engage in? 3. What would gradual release of control (or apprenticeship) look like at this stage? 4. At the end of the stage, how is the learner prepared for the subsequent stage? Chiu, M. M., McBride-Chang, C., & Lin, D. (2012). 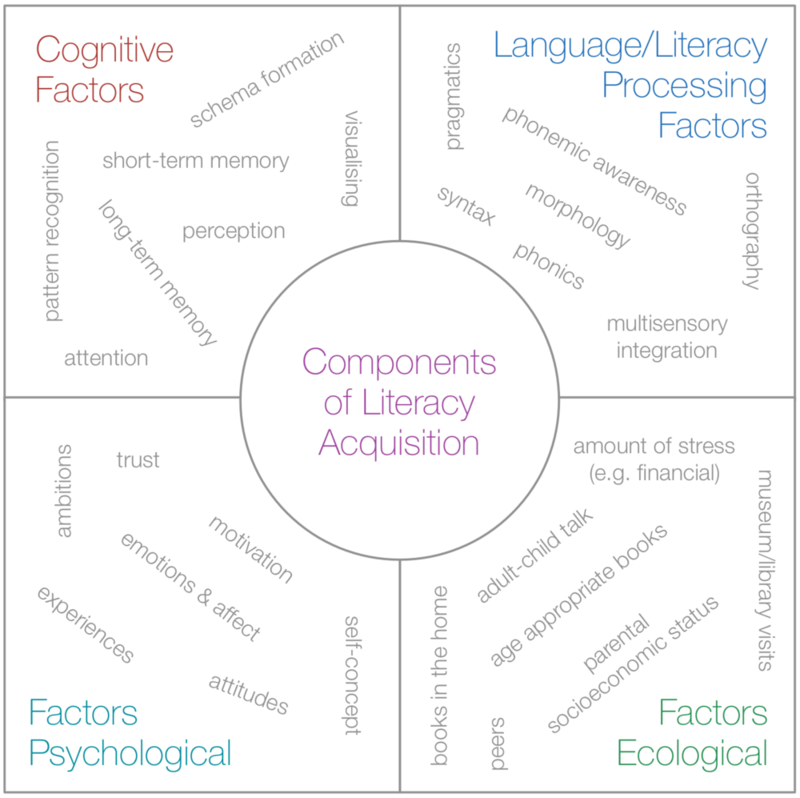 Ecological, psychological, and cognitive components of reading difficulties: Journal of Learning Disabilities, 45(5), 391–405. 5. What would be characteristic age range be for this stage? What support/intervention should be provided if a learner is failing behind? 6. How does one coordinate learning/support if there is a substantial difference between the learner's age and developmental stage? How does one choose content that is both linguistically and age appropriate? 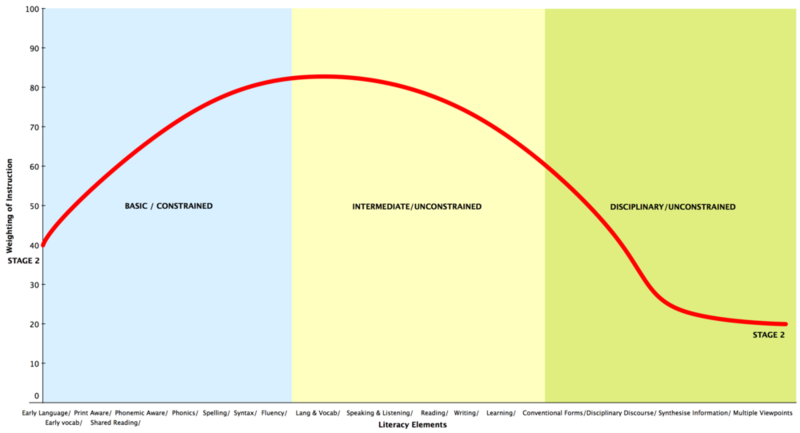 7 How can we use the component model of reading development (depicted to the right) to (a) identify potential assets/deficits exhibited by the learners and (b) to strategise with a multi-dimensional approach to building capacity in each area? 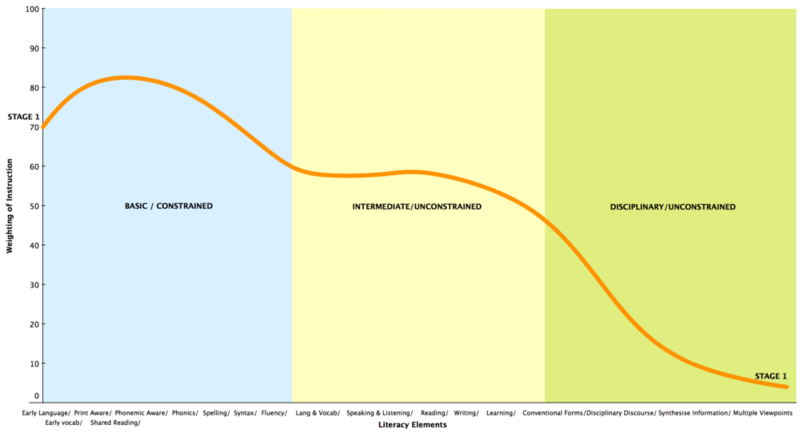 The sequence of images below demonstrates how the balance of instruction and approach alters across a learner’s lifespan. 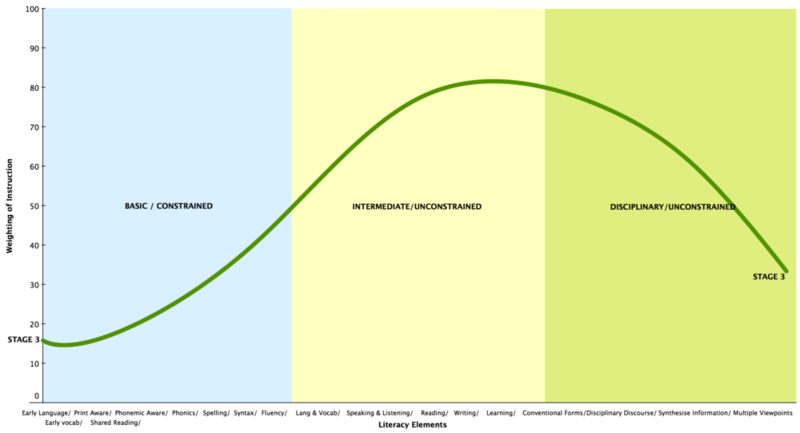 I invite you to explore the Stages of Literacy page. Explore and enjoy! p.s. 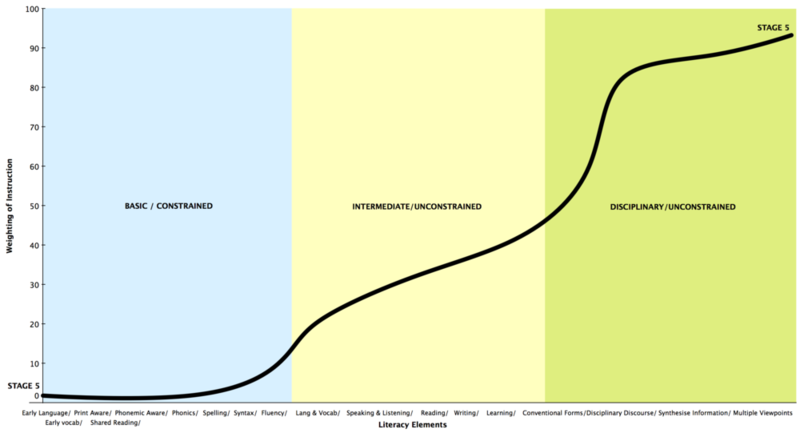 Even though one may be tempted to see skills progressing in a purely sequential manner, I would like to emphasise that each skill domain should be practiced/experienced to some extent at each stage of a reader/writer's development. The following table illustrates a significant point: at any given stage there should be literacy elements that we expect the individual to be able to practice explicitly (e.g. spelling) as well as other elements that individual can participate in with guidance (e.g. prompting or scaffolding a story) or jointly with a peer or adult.